The style or types of interior door casing is only limited to your imagination. You can buy casing all premade in wood or man made materials. Casing can be bought in raw form so you can stain the wood the color you like or can be purchased prestained. Casing comes in different styles and sizes. 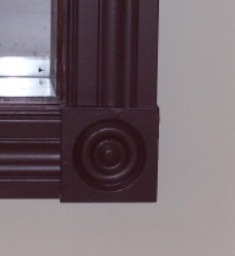 Some common door casing types are ranch, colonial, and princeton. Although if you don't want the common types there are many others to choose from. Another way to dress up common or plain casing is to add corner blocks or target blocks. These blocks are also premade with different designs and can be purchased but again you can make your own. You can just use 1x4 three quarter stock for casing if you want to. This is common in cabins or houses next to lakes and a lot of times in the pine wood variety and can be very elegant when used in certain settings. I have also seen this done with oak and is very nice looking. You can also make these in different sizes such as ripping the 1x4 stock down smaller. If you have the time but not the budget a simple cheap router with a few different bits can transform plain wood into some pieces of art. This will be a lot of work depending the amount of doors you are doing but creates a different look if thats what you want. So as you can see door casing is only limited to your imagination. Keep in mind that the premade casing made especially for doors and windows is good looking, also by following my step by step instructions can quickly and easily be installed if time is of the essence. Click casing interior doors for the instructions page. Return From Interior Door Casing page back to prehung interior doors page.